Ferrari unveiled their new GTE class racer in 2011 to take part in Championships sanctioned by ACO and FIA. 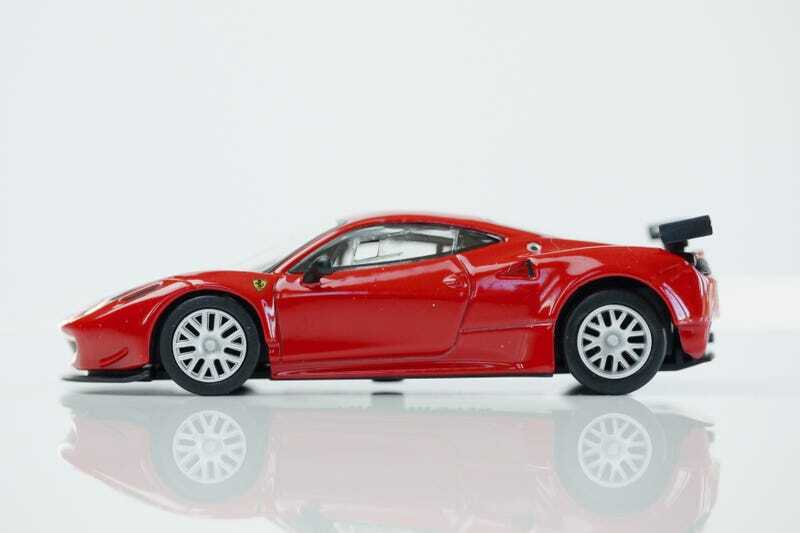 The 458 Italia GT2 drops the “flex splitter” found in the road cars and replaced with a more conventional inlet, with the air exit out through louvers in the bonnet. Under new restrictor regulations, the 4.5L engine produces 464 hp (346 kW; 470 PS), which is less than the road car and the 458 Challenge. Unlike the road car, which has a high-revving low-torque engine, the GT2 version only revs to 6,250 rpm, but maintains a close-to-stock torque number even with the horsepower loss. The double-clutch gearbox had to be replaced, but paddle-shifting is retained since rules in 2011 allow them. So far the 458 Italia GT2 has had an impressive racing record. The car won the 2012 and 2014 24 Hours of Le Mans, the 2012 12 Hours of Sebringand two editions of the Petit Le Mans, the first in 2011 and the second in 2012. In 2011 the 458 Italia GT2 took the Intercontinental Le Mans Cup GTE Manufacturers’ and the GTE PRO Team Titles, the Le Mans Series GTE Manufacturers’ and GTE PRO Team and Drivers’ honours and the International GT Open Overall and Super GT Team and Drivers’ crowns. The following year, with the creation of a FIA-managed World Championship, the car obtained the GTE Manufacturers’ and GTE PRO Team Titles in the FIA World Endurance Championship. In the same year the Italian car gained the European Le Mans Series GTE PRO Team and Drivers’ honours and the International GT Open Overall and Super GT Manufacturers’, Team and Drivers’ crowns. In 2013 the car repeated its successes, winning the FIA World Endurance Championship GTE Manufacturers’, GTE PRO Team, GTE Drivers’ and GTE AM Team Titles, the European Le Mans Series GTE Team and Drivers’ honours, the Asian Le Mans Series GTE Team and Drivers’ crowns and the International GT Open Overall and Super GT Manufacturers’ and Drivers’ Titles. In 2014 the 458 Italia GT2 achieved, for the third straight year, the FIA World Endurance Championship GTE Manufacturers’ and GTE PRO Team honours, as well as, for the second time in a row, the GTE Drivers’ crown (which had been instituted in 2013). For the fourth time the car also clinched the European Le Mans Series GTE Team and Drivers’ Titles, but it didn’t take part in the International GT Open and Asian Le Mans SeriesChampionships (the 458 Italia GT3 raced in both these series that year). In 2015 Ferrari 458 Italia GT2 cars compete in the FIA World Endurance Championship, European Le Mans Series and Tudor United SportsCar Championship. The OEM car on the left Kyosho car on the right in the two pics above. Today we have the Italia GT2 while a series 9 this model underwhelms a bit. It’s not as if Kyosho didn’t capture the essence of the car. I find the model to be a bit boaring. Now the OEM “fake” versions are better in my opinion with better wheels painted engines and tinted headlights. So given the boaring implementation I would still get this car again for my collection.